The Central Bank recently reported that the Irish economy is expected to hit full employment in 2019. Ask any business leader what concerns they have about the future and access to talent comes close to the top of their list. And yet the most recent census data shows that the workforce participation rate for women aged between 35 to 55 is 72% – 20% lower than for men. It is widely accepted that these women are the solution to Ireland’s looming talent problem. My advice to women? Don’t wait for organisations and governments to address the barriers to you returning -– a lack of flexibility being chief amongst them. Take hold of your own future and plot your own way back. As a high flier, I joined a graduate recruitment scheme with one of the accounting giants, it was 30 years ago! I had the same opportunities as my male colleagues and my career flew. Until, that is, when I decided to have children. Pregnancy for me limited my ability to travel which meant that I wasn’t available for some of those plum assignments. My career stalled and eventually I took a break, which ended up lasting 8 years. My current business partner of ‘She’s Back’ Deb Khan, whose career was in theatre and the creative arts, had been a lot more savvy and tenacious than me. When motherhood forced her to forgo an opportunity to work at one of the country’s leading theatres, she set up on her own as a consultant. Deb hustled hard, developed a great offer and built a hugely impressive roster of clients. Together, we set up ‘She’s Back’ because we wanted to help women to get back to work. Over the last four years, having talked to thousands of women, we realise that there is much that you can do for yourself. Be aware that very few “quality” jobs are advertised as having flexibility. Yes, you might need flexibility but first focus on getting the opportunity. Negotiate flexibility later if necessary. Don’t start there. Begin with you. Begin in your head. When I originally thought about returning to work, my first thoughts were all about the hurdles and barriers I would face. Would I be good enough? Was I too old? Would anyone take me seriously? It was only when I thought about the twenty years ahead of me that I was able to recognise that these were limiting beliefs – I would need to dispel them if I was to achieve my own personal ambition to return to fulfilling, well paid work. Once you’re clear in your head, you then need to get your story straight. What is it you want to do? Where are your strengths? Where can you add value? You need to have a clear, concise pitch that explains who you are and what you’re about. Why? Forget trying to find a job through a traditional recruiter. Not only are jobs rarely advertised with any flexibility, traditional recruitment process will throw out CVs with a gap on them. Recruiters like to place square pegs in square holes. Women who’ve had long, varied careers, which inevitably twist and turn, and probably have breaks on them, have varied CVs. They are not easy to pigeonhole, but boy are they invaluable if you’re prepared to spend the time. Research shows us that you are five times more likely to find a job through your network than you are from a recruiter. And that’s why you need the pitch. People will help you but you need to explain what you’re looking for so that they can. We know that women dislike the term “networking”; equating it to stuffy hotel rooms, warm chardonnay and uncomfortable chats with people you’re never going to meet again. That’s not what we mean. We mean being helpful, being interested in people, using all those wonderful connections you’ve built up over the years that can help you. Lastly, rather than focus simply on “getting a job”, think instead about “finding work.” The digital revolution has changed where, how and when work can be done. New business models are springing up to connect enlightened employers with women who have vital skills and simply need some flexibility in where, when and how the work gets done. “Work” no longer has to mean a full-time, permanent job. Women are highly flexible, great communicators and fast learners. They have been rapid adopters of social media and remain powerful consumers. Just the sort of talent required in the 21st century. Work needs women and women want to work. Let’s not wait for organisations to change; let’s lead by example and get the job done. She’s Back – the book by Lisa Unwin and Deb Khan is published by Urbane Publications and available through Amazon. 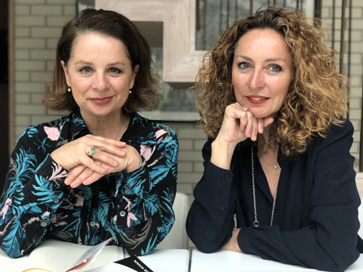 Lisa Unwin (pictured on the right) and Deb Khan (pictured left) are Co-founders of She’s Back – a company whose purpose is to enable business to access the unique talent in women returning to work after an extended career break.